Adapting to climate impacts in Thailand’s agricultural sector – What to do first? Over the past 24 months, the UNDP and FAO-supported Integrating Agriculture in National Adaptation Plans Programme (NAP-Ag) – funded by the German Ministry for the Environment, Nature Conservation, Building & Nuclear Safety (BMUB) through its International Climate Initiative (IKI) – has been conducting a capacity-building programme to help Thailand’s Ministry of Agriculture and Cooperatives (MoAC) identify and prioritize actions with limited resources. Which climate risks and impacts threaten crop productivity the most? What capacities are most pivotal to strengthen among farmers and other sector stakeholders, to cope with likely changes? What measures and projects should be promoted on a priority basis to respond to future needs? Which criteria are most relevant to consider when prioritizing these adaptive responses? These questions are front and centre of adaptation planning in Thailand’s agricultural sector, a sector already seeing the impacts of climate change in the form of shifting temperatures and more unpredictable rainfall. According to a 2012 study undertaken by the International Center for Tropical Agriculture (CIAT), the total economic impact of climate change on agriculture in Thailand is predicted to range between US$300 million to US$420 million (9.8 to 13.9 billion Thai Baht), with yields of major crops such as rice, maize and sugarcane falling by 3.6 percent – and up to 15 percent – by 2050. 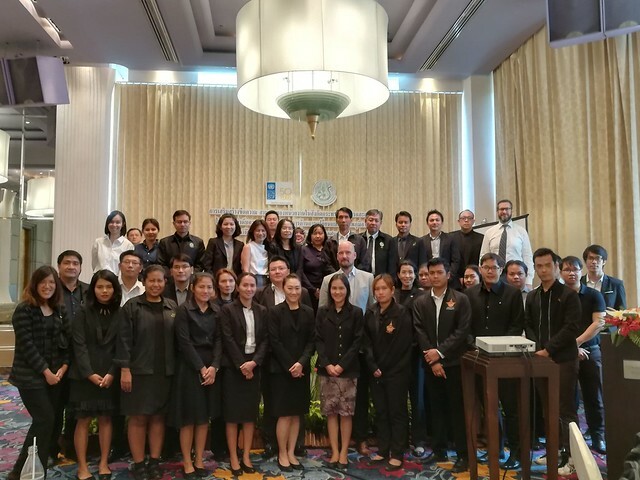 So far, two UNDP-hosted workshops (June and October 2017) – attended by over 70 officials from departments under MoAC – have focused on prioritization for adaptation planning, using Multi-Criteria Analysis (MCA); and developing a preliminary screening system for ranking and fine-tuning ongoing climate-sensitive projects and programmes. The workshop in June focused on providing an overview of MCA as a tool to priority actions. Participants gained a better appreciation of the process and key steps involved, as well as its strengths and limitations in the context of climate adaptation planning. Feedback and key insights were also gained by MoAC on how MCA could be used in the context of implementing Thailand’s new sectoral climate change strategy (ACCSP). In a follow-up workshop in October, participants learned the key steps to apply tools and methods in the context of their work. After identifying key areas from the revised five-year Agricultural Climate Change Strategic Plan 2017-2021, MoAC is enhancing its capacity with the support of the NAP-Ag programme to prioritize these activities, which will be funded under the Ministry’s annual budgetary cycle and put forward to international climate funds. Multi-Criteria Analysis (MCA) is a tool that can help decision-makers make hard choices in the face of uncertainties and real-world complexity. In Thailand, pre-identified activities linked to the ACCSP strategy were scored and ranked according to criteria – such as policy alignment, implementation capacity (i.e. availability of financial and human resources and prior country experience in the type of project), potential to reduce future climate impacts (both disaster and slow-onset in nature), and the effectiveness and appropriateness of the technology to respond to the problem. The NAP-Ag programme support will continue in 2018 with further consultative sessions with line departments to rank and prioritize programmes for appraisal and budget formulation. The skills acquired will be useful to finalise and implement the ACCSP in the coming months and mobilize additional financial resources. This is seen by stakeholders as a key instrument to mainstream climate change into planning, to help safeguard agricultural GDP and strengthen farmer resilience. Follow @HodesGlenn and @RohiniKohli1 on twitter for updates related to climate finance and climate adaptation policy.